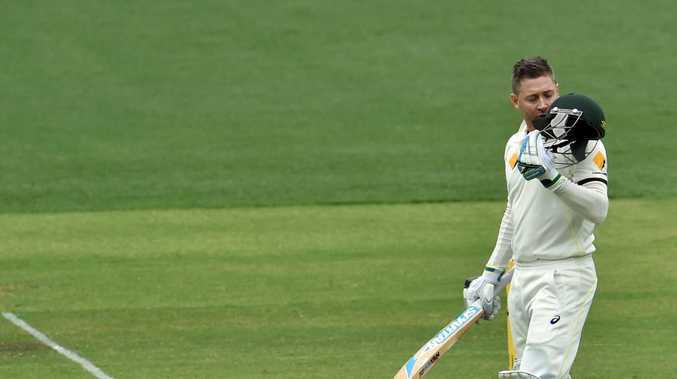 AUSTRALIA captain Michael Clarke looked in immense pain after almost every delivery on a rain-affected day two of the first Test against India at the Adelaide Oval. But nothing - and not even four injections for his degenerative back - could stop him from reaching three figures, for his fallen "little brother" Phillip Hughes. The Aussies were 7-517 with stumps called early due to bad light on a day when the play was stop-start due to constant showers. Clarke, dismissed late in the day for 128, could not jump for the skies like teammate David Warner did when he reached his own ton on Tuesday. But the inspirational captain had tears in his eyes when he reached his milestone in Hughes's memory - it will be a hundred he will never forget. It was also his seventh century at Adelaide - the most at the venue by any Australian batsman - and the 28th of his Test career. Clarke, noted for his quick footwork, had to play many shots from the crease due to his back pain, but proved just how skilful he is by inventing some crafty late cuts. Teammate Steve Smith, unbeaten on 162, also provided the crowd with plenty of entertainment. In a half-hour session late in the afternoon, the No.5 took to express paceman Varun Aaron, hitting him for two spectacular consecutive fours, the first after clearing his front leg and freeing his arms. Then, on the fifth ball of the same over, Smith again belted Aaron, this time back over his head for another boundary. It was the 25-year-old's fifth century in a Test career which is improving rapidly. He caused leg-spinner Karn Sharma anguish late in the day - dropped three times off his bowling. Smith and Clarke combined for a stand of 163 - the highest seventh-wicket partnership by Australia against India. Warner, Smith and Clarke also made history - it was the first time three New South Welshmen have scored centuries in the same innings of a Test for Australia. And they did so with added emotion, in memory of their fellow New South Welshman and great mate Hughes.